A rideshare passenger was killed and three others were injured when a DUI suspect plowed into a Lyft car overnight on a San Diego freeway, authorities confirmed. The deadly collision happened just after 2:30 a.m. along southbound State Route 163, north of Laurel Street near San Diego's uptown area. Both cars ended up drifting off the freeway, landing in a ditch off the shoulder. California Highway Patrol Sgt. Brent Lowry said the crash involved a white Mazda sedan – which was a Lyft vehicle, carrying the driver with two passengers in the backseat – and a 2016 Lexus sedan, carrying its driver. Lowry said one person was ejected from the Mazda. The three other victims of the crash suffered serious injuries, the sergeant said, and were all hospitalized. A few hours later, the CHP told NBC 7 that the driver of the Lexus -- a 21-year-old woman -- had rear-ended the Lyft car. She is suspected of driving under the influence, according to CHP. The DUI suspect suffered major injuries and was taken to Scripps Memorial Hospital. Lowry was also able to confirm that the person who died was one of the Lyft passengers: a 40-year-old man from San Francisco. He had been sitting on the left, in the backseat, and was wearing his seatbelt. 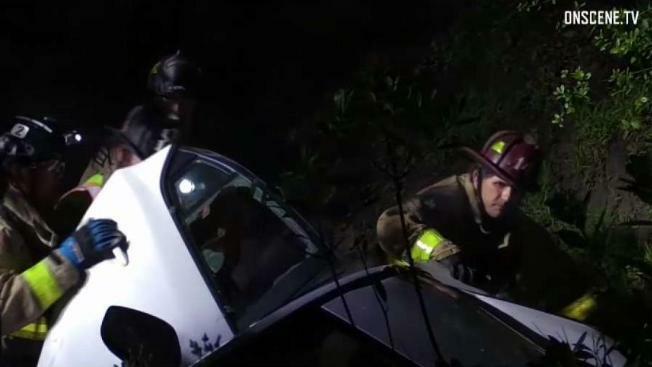 Following the crash, the victim was stuck inside the Mazda and firefighters had to break apart the top of the car to remove the man's body. His name has not yet been released by investigators as they work to notify his family of his death. Lowry said the other passenger inside the Lyft was a 33-year-old man from San Leandro, California. That passenger was not wearing his seatbelt and was the person ejected from the rideshare vehicle. He suffered major injuries but survived and was also taken to Scripps Memorial Hospital. The Lyft driver, a 27-year-old Santee resident, was buckled in. He suffered moderate injuries and was taken to UC San Diego Medical Center, Lowry said. The deadly collision remains under investigation. Meanwhile, the freeway was shut down for about 20 minutes following the crash. At least one lane remained closed hours after the crash.